This painting depicts the front of the artist's house in Giverny seen from the garden. Of the house, in the background, we can see the dark slate roof (which the light tinges in violet), the dark gaps of the first floor windows, and an opening (door or window) on the ground floor. Two large rose trees in bloom frame the composition: the one on the left, represented in the foreground, is cut by the edge of the painting; that on the right, a little further behind, can be seen almost in its totality. The rose trees and the house cover most of the pictorial plane; the rest is taken up by the sky and a clump of blue lilies (with the flowers already withered), in the foreground. From 1913 and until his death, in 1926, Monet was busy mainly with the large decorative series of the Water Lilies. All the other works executed in those years are views of his garden. These are paintings with a conventional format, executed mainly outdoors, which can be divided into several groups according to their subject; the largest is devoted to the so called "Japanese bridge". Very few of them are signed and dated; therefore they can only be given an approximate date based on circumstantial information. The series to which this painting belongs is formed by six pictures (W 1953-1958). 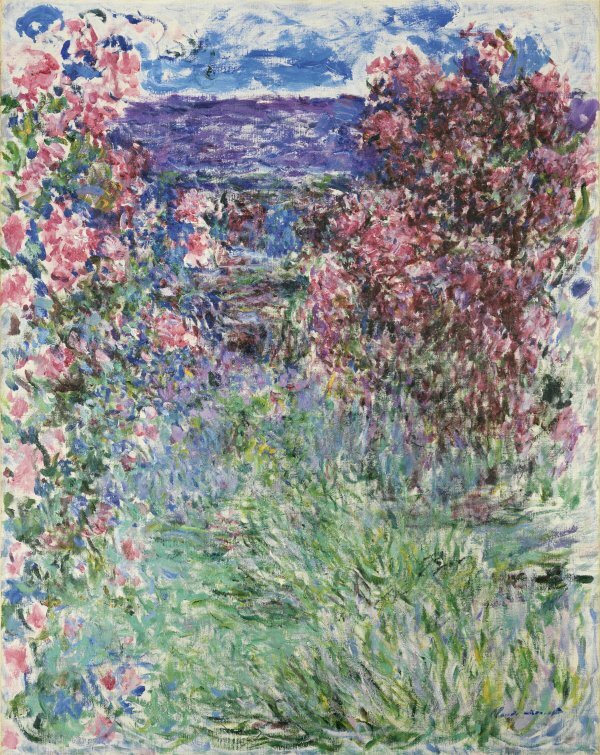 In accordance with information provided by people who had visited Monet's studio, Wildenstein dates them in the summer of 1925. Monet, who had been suffering from cataracts since 1912, was eventually operated on in 1923. As a consequence of the operation, he suffered from alterations in his perception of colour and had to undergo a series of corrective treatments with no positive effect until the spring of 1925. Then he began to work intensely. In a letter to his friend André Barbier, dated in July, Monet excuses himself for not being able to receive him as "I must be free at 10 in the morning to go back to work. This is for me an unsurpassable joy. Since your last visit my sight is a lot better. I work as never before and I am very satisfied with what I am doing. If my lenses were even better, I could only wish to live until I am one hundred years old." Unlike the garden views painted in previous years (some of which tend to monochromy), those executed in the summer of 1925 show a more varied palette and brushstrokes in the shape of short commas. The painting we are analysing is one of its best examples. The series of six paintings (three horizontal, two vertical and one square) in which the house is seen from the front is characterised by a more meticulous finish yet, at the same time, the colours breathe more freely. The frontal view tends to reinforce the play-stronger in the two works with a vertical format-of the compositional symmetry and this in turn, as ocurrs in the landscapes painted by Jawlensky in the 1910s, produces the effect of a hieratic attitude that reinforces Monet's closeness to the new abstract painting of the 20th century.